Download "BIOLOGICAL SCIENCES. What can I do with this degree? 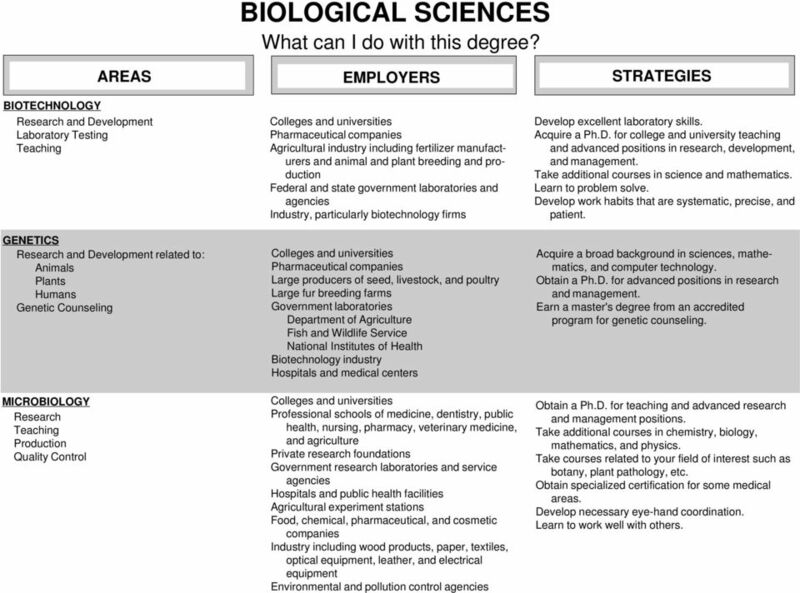 EMPLOYERS"
1 AREAS BIOLOGICAL SCIENCES What can I do with this degree? BIOTECHNOLOGY and Development Laboratory Testing GENETICS and Development related to: Animals Plants Humans Genetic Counseling MICROBIOLOGY Production Quality Control Agricultural industry including fertilizer manufacturers and animal and plant breeding and production Federal and state government laboratories and agencies Industry, particularly biotechnology firms Large producers of seed, livestock, and poultry Large fur breeding farms Government laboratories Department of Agriculture Fish and Wildlife Service National Institutes of Health Biotechnology industry Hospitals and medical centers Professional schools of medicine, dentistry, public health, nursing, pharmacy, veterinary medicine, and agriculture Government research laboratories and service agencies Hospitals and public health facilities Food, chemical, pharmaceutical, and cosmetic companies Industry including wood products, paper, textiles, optical equipment, leather, and electrical equipment Environmental and pollution control agencies Develop excellent laboratory skills. 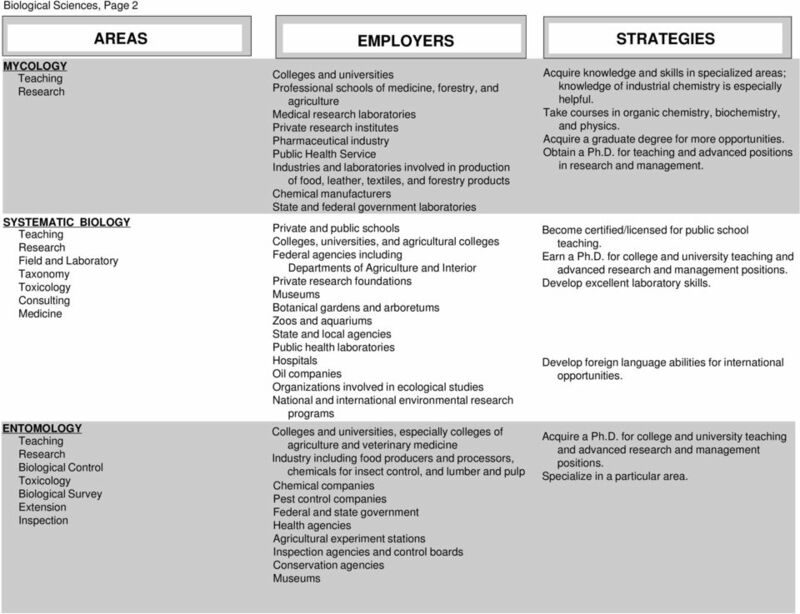 and advanced positions in research, development, and management. Take additional courses in science and mathematics. Learn to problem solve. Develop work habits that are systematic, precise, and patient. Acquire a broad background in sciences, mathematics, and computer technology. Obtain a Ph.D. for advanced positions in research and management. Earn a master's degree from an accredited program for genetic counseling. Obtain a Ph.D. for teaching and advanced research and management Take additional courses in chemistry, biology, mathematics, and physics. Take courses related to your field of interest such as botany, plant pathology, etc. Obtain specialized certification for some medical areas. Develop necessary eye-hand coordination. Learn to work well with others. 2 Biological Sciences, Page 2 MYCOLOGY AREAS SYSTEMATIC BIOLOGY Field and Laboratory Taxonomy Toxicology Consulting Medicine ENTOMOLOGY Biological Control Toxicology Biological Survey Extension Inspection Professional schools of medicine, forestry, and agriculture Medical research laboratories Private research institutes Pharmaceutical industry Public Health Service Industries and laboratories involved in production of food, leather, textiles, and forestry products Chemical manufacturers State and federal government laboratories Private and public schools Colleges, universities, and agricultural colleges Federal agencies including Departments of Agriculture and Interior Botanical gardens and arboretums Zoos and aquariums State and local agencies Public health laboratories Hospitals Oil companies Organizations involved in ecological studies National and international environmental research programs, especially colleges of agriculture and veterinary medicine Industry including food producers and processors, chemicals for insect control, and lumber and pulp Chemical companies Pest control companies Federal and state government Health agencies Inspection agencies and control boards Conservation agencies Acquire knowledge and skills in specialized areas; knowledge of industrial chemistry is especially helpful. Take courses in organic chemistry, biochemistry, and physics. Acquire a graduate degree for more opportunities. Obtain a Ph.D. for teaching and advanced positions in research and management. Become certified/licensed for public school teaching. Earn a Ph.D. for college and university teaching and advanced research and management Develop excellent laboratory skills. Develop foreign language abilities for international opportunities. and advanced research and management Specialize in a particular area. 3 Biological Sciences, Page 3 AREAS MARINE AND AQUATIC BIOLOGY Food Inspection ZOOLOGY Animal Care/Training Animal Behavior Curator BIOMEDICAL Physiology Biophysics Biochemistry Pharmacology Nutrition Immunology Pathology Quality Control Engineering Federal, state, and local agencies International agencies Inspection organizations Private recreation organizations laboratories Zoos Armed services Shipping industry Manufacturing Fish hatcheries and organizations raising fish Wildlife preserves and parks Zoos, aquariums, and other collections of animals organizations Pharmaceutical, chemical, and agricultural service industries Federal and state agencies Professional schools including colleges of pharmacy, dentistry, medicine, veterinary medicine, and agriculture Clinics and hospitals Drug companies Federal laboratories and regulatory agencies Independent testing laboratories Public health departments Industrial laboratories including chemical, petroleum, food processing, drug, and cosmetic manufacturers Armed services Develop a good foundation in mathematics, computer science, statistics, and humanities. and advanced research and management Obtain experience related to fishing and boating. Specialize in fisheries science. Acquire excellent communication skills. Obtain experience working with animals and various related laboratory equipment. Develop a broad background in biology and other related subjects such as chemistry, physics, mathematics, and statistics. Acquire a graduate degree for advancement and specialized Obtain a Ph.D. for teaching and advanced research and management Complete a related internship at a zoo or aquarium. Obtain a Ph.D. for college and university teaching and advanced research Acquire a background in physics, organic and physical chemistry, mathematics, and anatomy. Take courses in area(s) of specialization. 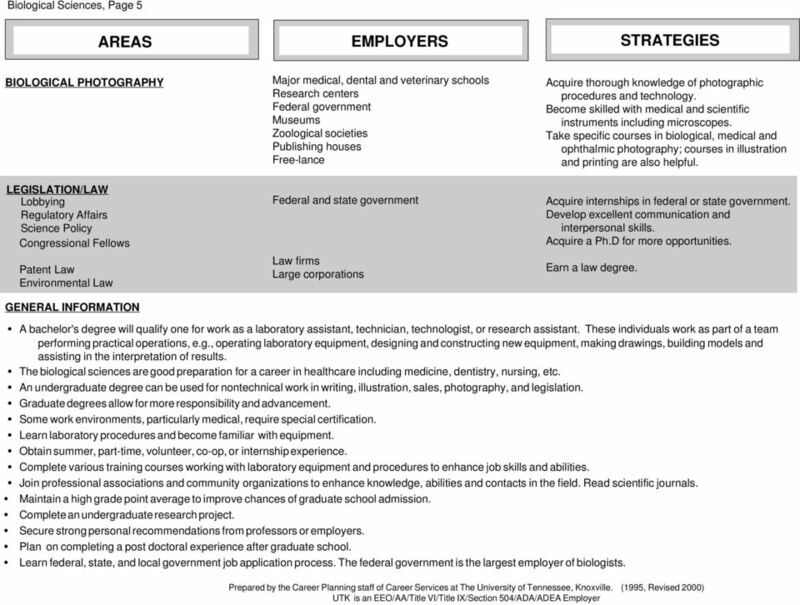 Acquire advanced degrees in areas of specialization; some may require an M.D. Obtain a degree in biomedical engineering or engineering technology. 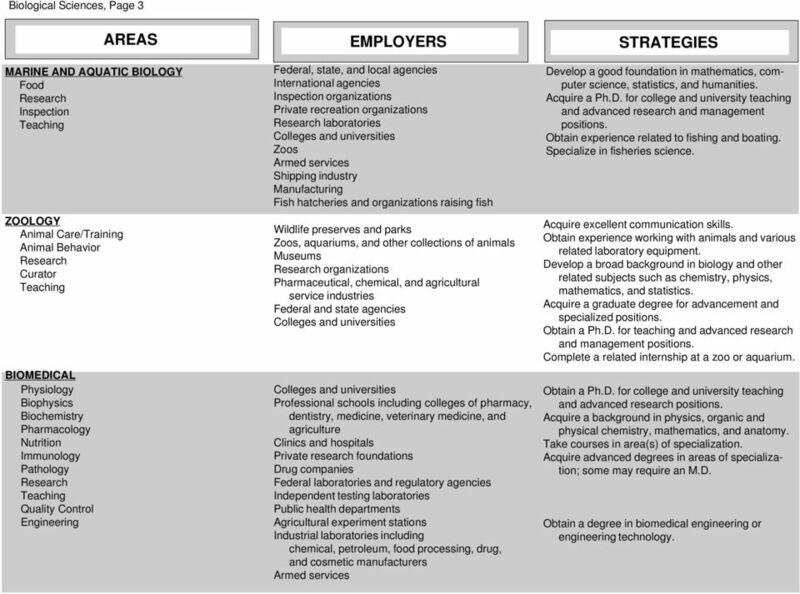 4 Biological Sciences, Page 4 AREAS BIOINFORMATICS Biotechnology industry Government research laboratories Universities Double major or minor in computer science. Learn to work well in teams and acquire the ability to interface with scientists. Develop in-depth programming and relational database skills. Learn molecular biology packages, web design, and programming skills. EDUCATION Non-classroom education Public and private schools, K-12 Zoos Nature centers Parks Certification is required for public school teaching Gain experience working with students through tutoring or volunteering. Learn to work well with all types of people. Develop excellent interpersonal and public speaking skills. TECHNICAL WRITING Editing Writing ILLUSTRATION TECHNICAL AND PHARMACEUTICAL SALES Newspapers Publishing companies including scientific magazines, professional journals, periodicals, textbooks, and online publishers Publishing companies of textbooks and scientific magazines or books Medical and veterinary colleges Manufacturing firms including pharmaceuticals, animal pharmaceuticals, laboratory equipment, medical supplies and prostheses Take technical writing classes or minor in it. Develop strong writing skills and command of the English language. Minor in journalism. Acquire word processing and desktop publishing skills. Double major or minor in graphic illustration. 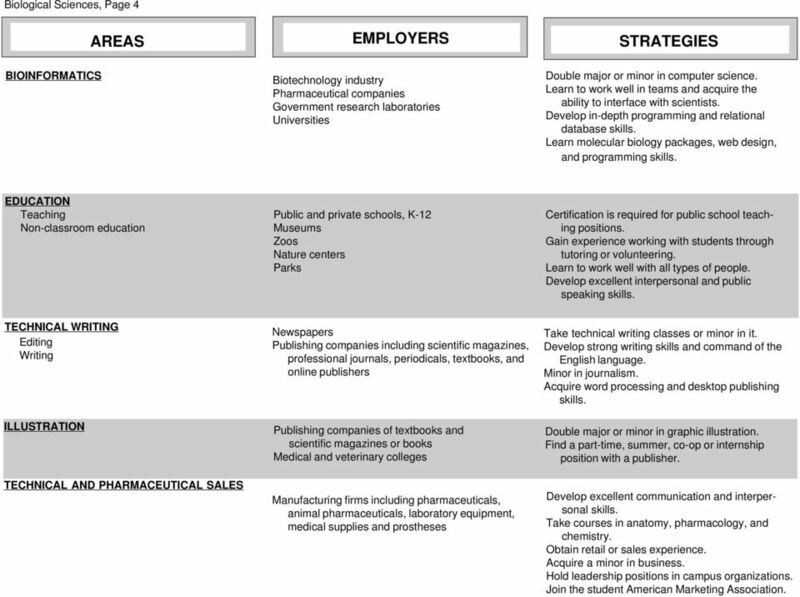 Find a part-time, summer, co-op or internship position with a publisher. Develop excellent communication and interpersonal skills. Take courses in anatomy, pharmacology, and chemistry. Obtain retail or sales experience. Acquire a minor in business. Hold leadership positions in campus organizations. Join the student American Marketing Association. The mission of the Department of Biology is to: Provide students with a fundamental knowledge of Biology. Prepare students for and assist them in entering graduate and professional school, and the workforce. ANIMAL SCIENCE What can I do with this major? MARINE SCIENCE. What can I do with this major? ENVIRONMENTAL STUDIES/SCIENCE What can I do with this degree? CHEMISTRY What can I do with this major? PHYSICS. What can I do with this major? A Degree in Science is: Intellectually stimulating Can lead to a variety of careers: Scientific Research (with opportunities for working with animals) Teaching Science-related jobs Advisory Sales Patents..
BIOSYSTEMS ENGINEERING What can I do with this major? ENVIRONMENTAL SCIENCE What can I do with this degree? PUBLIC HEALTH. What can I do with this major? HISTORY What can I do with this major? ENGINEERING What can I do with this major?